Home beauty dailythings Diet diply DIY fitness Food Girls Guys Health & Wellness Health and Wellness Interesting knowledge Nutritions recent slider Do Your Bruises Look Like This? THIS Is What It Says About Your Blood! 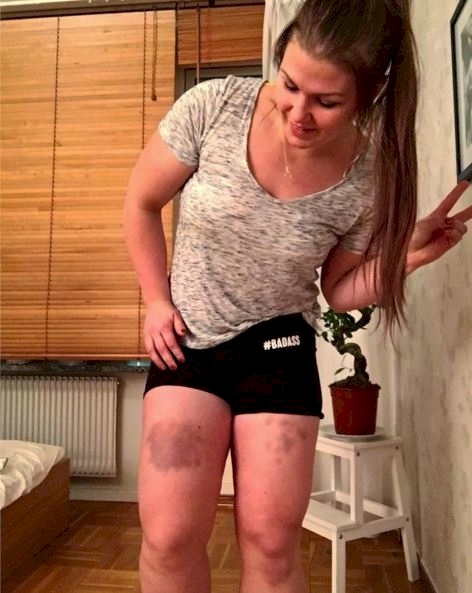 Do Your Bruises Look Like This? THIS Is What It Says About Your Blood! Every day of my life, there will be a bruise somewhere on my body. No, I'm not part of a fight club – that would be way cooler than the reality. I'm just a massive klutz. I have special gloves to keep me from cutting myself when chopping vegetables. I have hard-toed shoes so that I won't stub my toe when I'm hiking. But there's nothing that can save me from bumping into table edges and tripping on sidewalks. Yes, sidewalks. This happens more often than I'd like to admit. So as a constant klutz, this handy guide will be highly helpful. Now I'll know whether I can just take the table in stride, or take a trip to the hospital... again. We all get them, but why? Whenever you bump, scrape, or fall, small blood vessels break and the blood leaks into the soft tissue beneath the skin, according to Medline Plus. 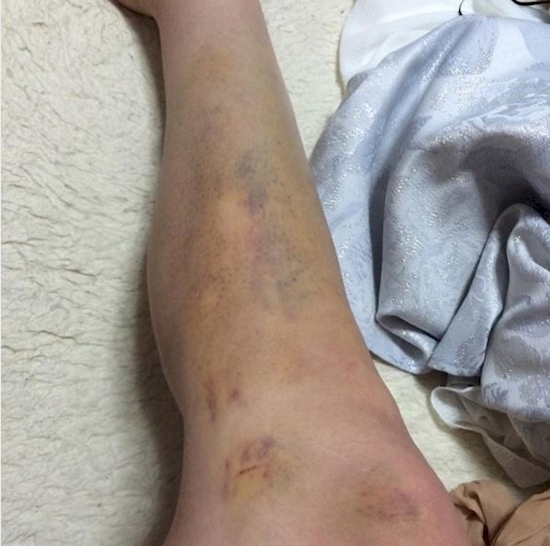 The bruise can become black and blue, changing in color as the body reabsorbs the blood and heals. It's not usually just a bit black. Swelling and pain usually comes along with the bruise. A lump over the injury can also occur from pools of blood collecting under the damaged tissue. 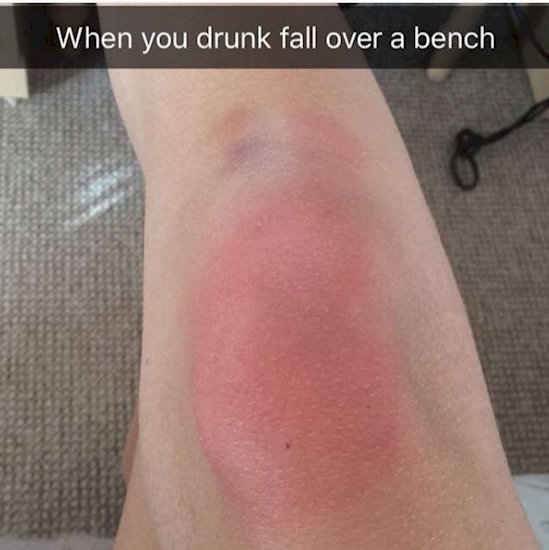 But not all bruises are equal. One can be much more serious than the other. So take a look at your bruise and follow along to make sure you're treating your bruise with the love and care it needs. But if you're concerned, the best advice is always to consult your doctor. Just like its description, this raspberry colored bruise usually pops up as a red blob during the first stages of the injury. The bright red happens because of the high iron and oxygen content in the blood. They won't be there for long. 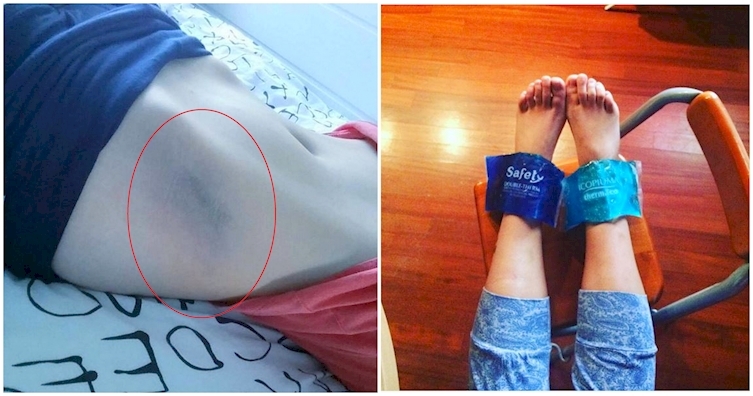 If the red stage is the peak of your injury, your bruise isn't going to last long. 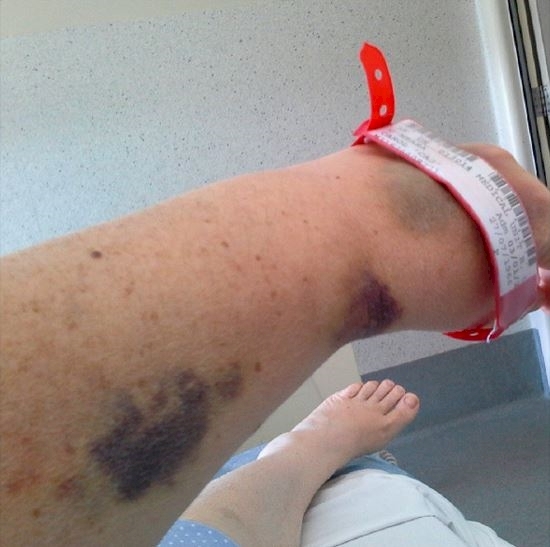 There weren't too many blood vessels broken, so your bruise should heal relatively quickly. But this bruise is just the tip of the bruised ice berg. This is what I usually get, and it seems to sneak up on me every time. I look down and BAM: there's a big ol' blue bruise staring me in the face. 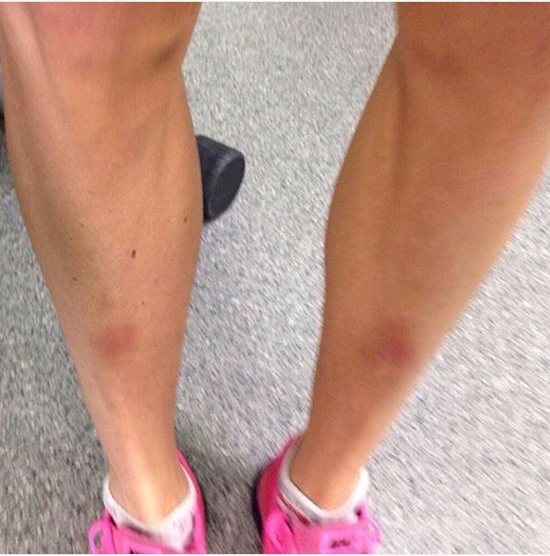 Blue bruises can pop up in a few hours, so you may even miss the red stage. But why blue? It's still blood, right? Yes, but there's MORE blood. With all that blood collecting, it gradually starts to lose its oxygen. 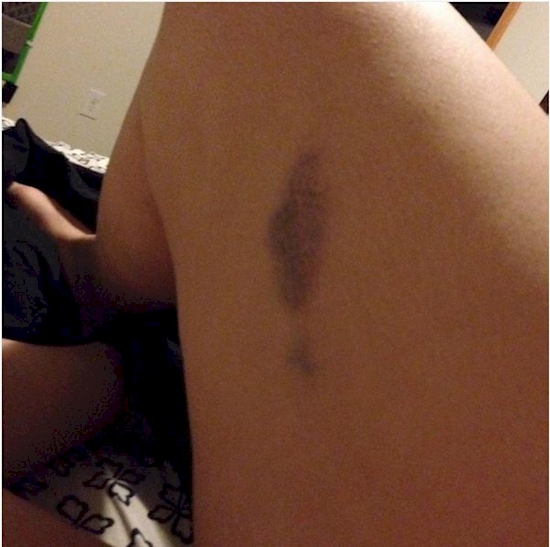 As this happens, your bruise will begin to turn blue or purple in color. 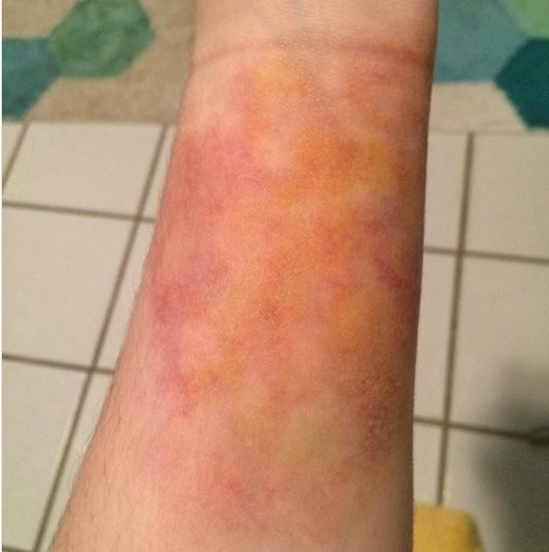 The worse the injury, the deeper the color. The bruise can even turn almost black and the red blood cells break down and iron is released into the injury. Ew. This is by far the grossest part. There are so many disgusting colors all over me, I feel like barfing every time I look at my sore foot... or thigh... or arm. Man, I'm clumsy. 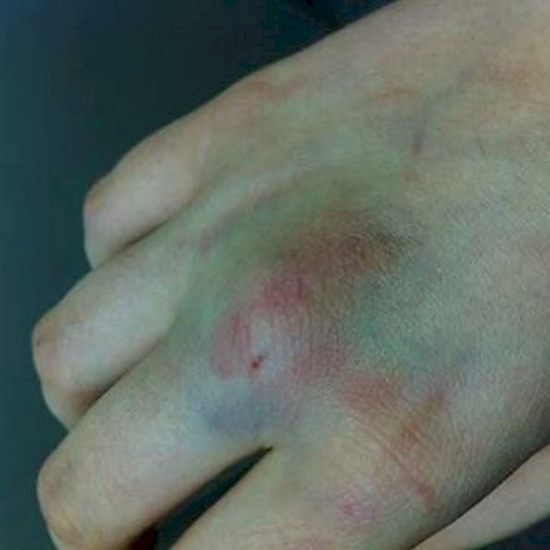 But it turns out all those colors green colors at the edge of my bruise mean something wonderful. 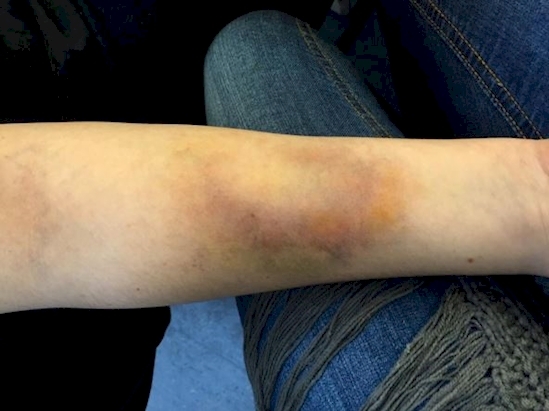 As bruises begin to heal, the body releases hemoglobin – protein-packed iron that turns the chemicals in your skin all these whacked-out colors. But it's the next color, you'll be dying for. Still not as pretty as your normal skin color, but you can be happy that you're almost back to normal. You'll again start noticing the change along the edges of your bruise, with the rainbow of nasty colors finally coming to a close. Just one more chemical to close off your bruise. As your body clears away the final debris left over for the bleeding under your skin, a chemical is released to help break it all down called bilirubin. Finally, your skin is clear, and you can go back to the countdown to when you'll have your next bruise. If three days go by and you're still in pain after a pretty minor injury, have frequent bruises for unknown reasons, or experience abnormal bleeding elsewhere, such as in your stool or urine, you should definitely consult your doctor. These and other symptoms could indicate a more serious problem, such as a problem with blood clotting, or a blood-related disease. When in doubt, your doctor always knows best. But you can speed the process along! If your doctor says things are okay, and if you're constantly getting bruised up like me, whether as a klutz or you're actually involved in sports or something, then there are a few things to help yourself heal that the Mayo Clinic recommends. 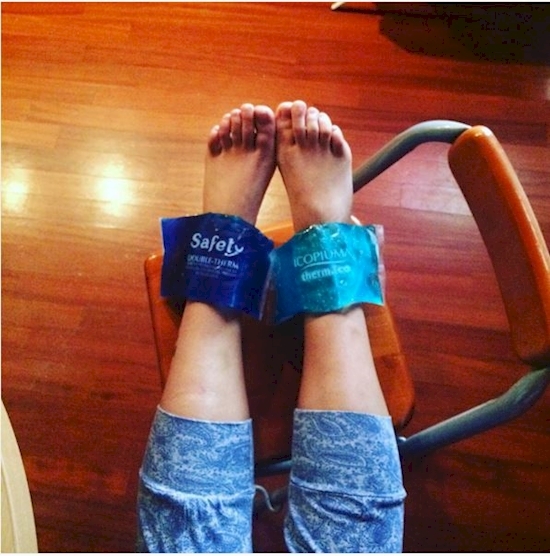 Keep the injury lifted, and apply some ice to it wrapped in a towel for about 10 minutes. Rest the bruised area if possible, and take some acetaminophen for pain relief, or ibuprofen to reduce swelling while relieving pain.